After much deliberation, and help from my friend Karen in Colorado, the quilt has finally been blessed with a name. The design was originally adapted from a mosaic tile design and reminds me of something you would find in a fabulous cathedral somewhere in Europe. 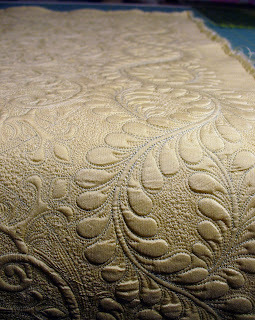 Having the name in French gives it elegance and class...the translation describes the quilt simply and beautifully. Thank you Karen! Because I want to show the entire process of the quilt, I wanted to share the blocking process as well as the hanging sleeve. The photos that I am sharing with you on my blog will also be in my new handbooks with detailed instructions. I'm multitasking here! 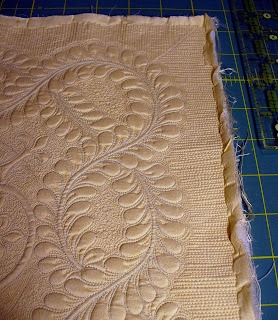 When I quilted my repetitive lines on the outside edge of this piece I was careful to extend them past my desired cutting line by at least 1/4" or more. This will give me a hard edge to to mark and trim on later when I'm squaring up. 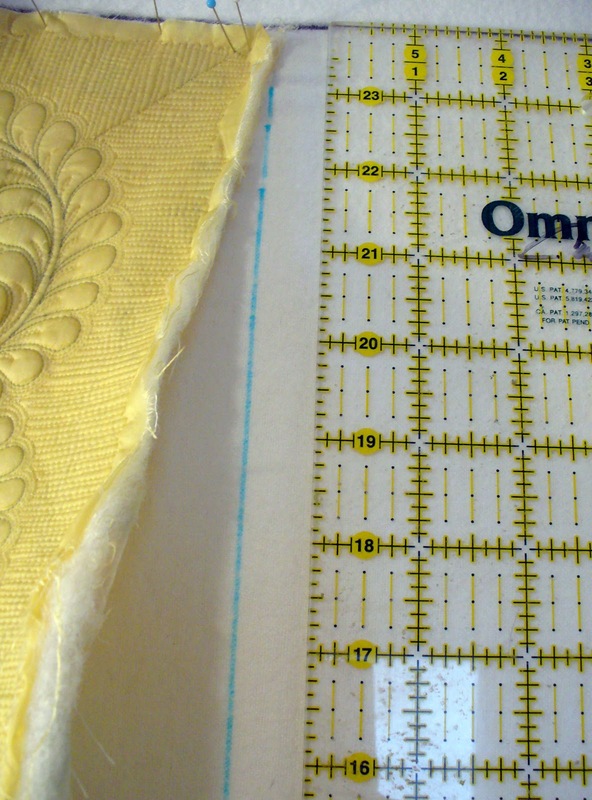 I placed my large square ruler on the quilt and "squared it up" PAST my quilted repetitive lines and cut. This is a rough draft of sorts. 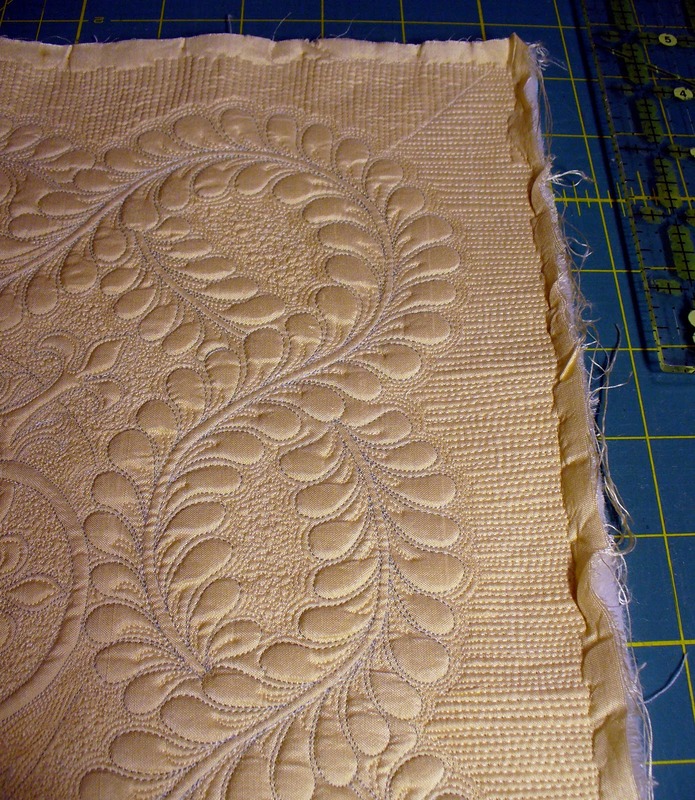 I'm always worried about fraying edges and permanent pin holes in the edges of my wholecloth quilts. By cutting a "rough draft" first this eliminates that worry. I soaked this piece in warm water and Orvus paste quilt soap for about 30 minutes. I used warm water as I had this piece straight basted with Vanish Lite thread and the warm water helps it to easily dissolve. Once soaked and well rinsed, I placed the wet quilt on a large towel, rolled it up cinnamon roll style and squeezed the excess water out of it. 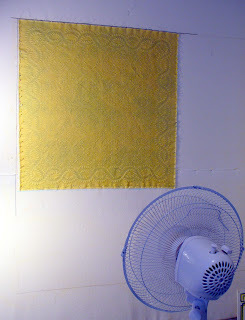 I have a large design wall that I use for blocking my quilts. Using a permanent Sharpie marker, I made a straight line horizontally at the top and then another line perpendicular to it on the left. These lines are always on my wall and are never removed. 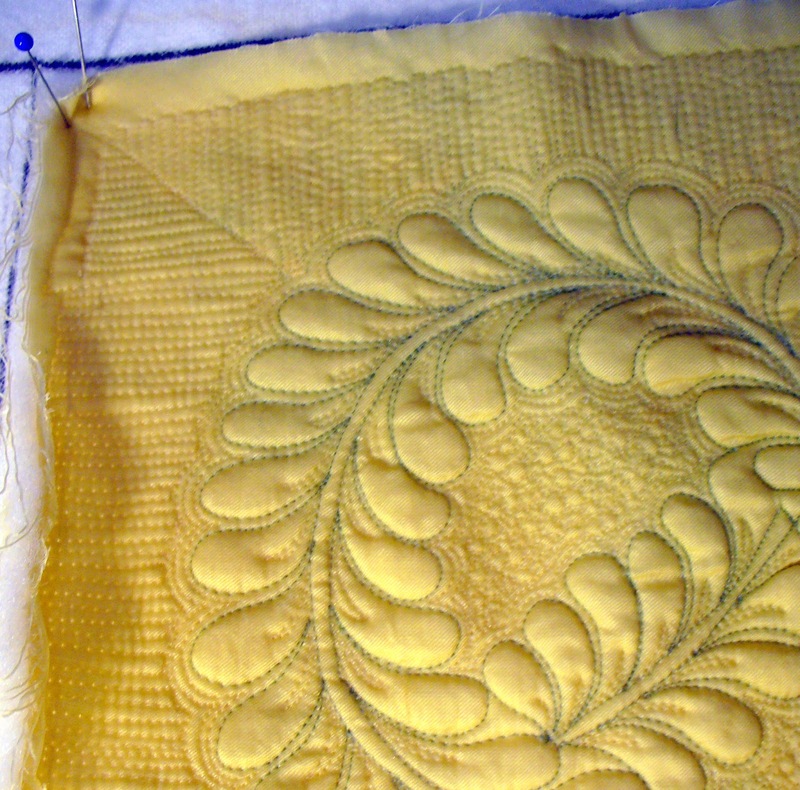 I take the top left hand corner of the quilt and line it up NEXT to these black lines and firmly double pin. I gently stretch the piece and firmly place a pin about every inch. 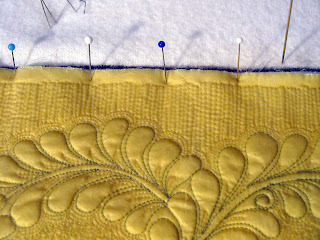 I'm always careful to place the edge of the wet quilt next to the line and only gently stretching. Once the top is done I move to the left side and repeat the whole process. When the left side is done it's time to move to the right side. I take my ruler and line it up perfectly with my marked black line and the right hand corner of my piece. Using my blue Mark-B-Gone pen (water soluble), I draw a straight line all the way down. This is where the right edge of my piece should come to. I repeat the whole process again for the right side. I repeat the whole process for the bottom edge. 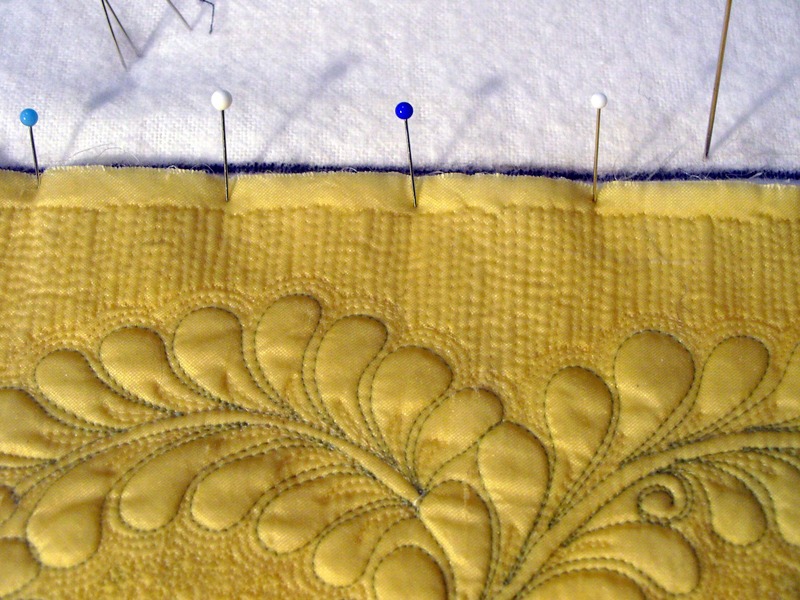 It's important to note that when you are pulling and easing the edges of the quilt into straight-ness you may notice that one of the other already pinned sides may loosen up or distort...that's normal. You will need to go back and repin these if this happens. Once my piece is completely blocked and pinned I turn on a fan and let it air dry for the remainder of the day and sometimes into the next day. 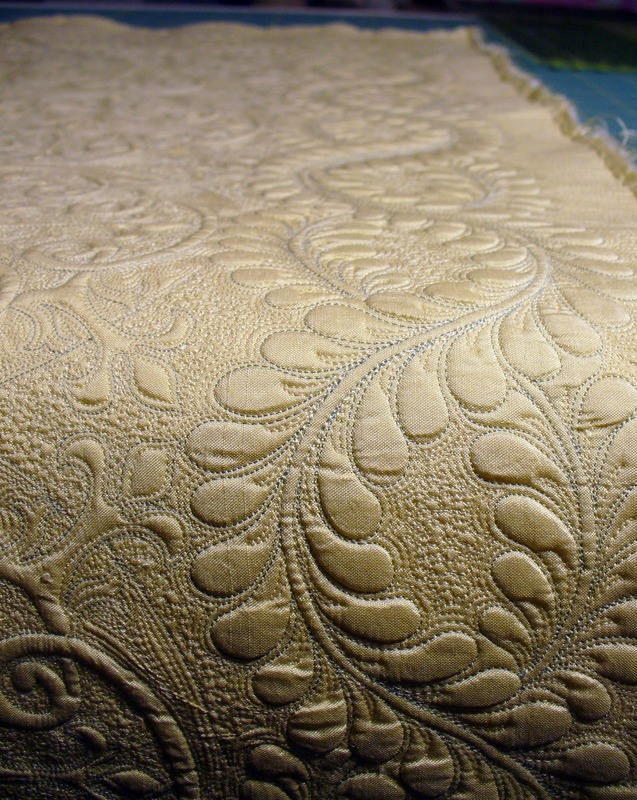 Depending upon the quilt, and after it's dry, I will sometimes take a steam iron and light steam to help set the block before taking it down. 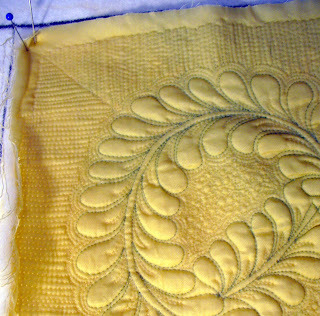 (You may see that this quilt looks a little blotchy...because it is soaking wet you see the colors from the backing fabric showing thru...this goes away when it is dry). Once my piece was dry I removed it from the board and gave it an ever-so-gentle pressing. I put it back on the cutting mat and carefully trimmed. Note that this time I am trimming on top of the oversized repetitive lines. I get a much straighter cut this way! 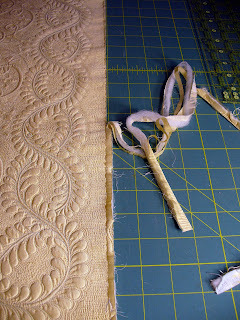 I then add my binding. 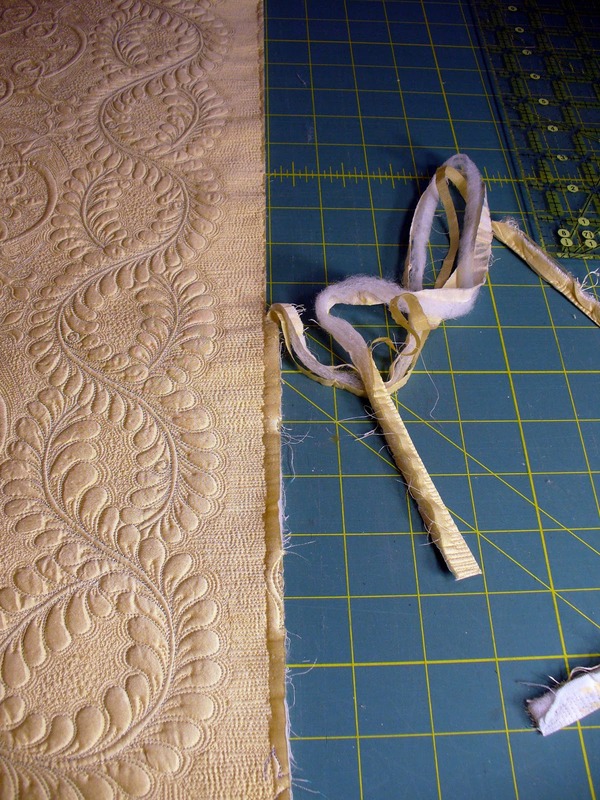 Blocking is very time intensive...always allow plenty of time for this process. Really good loud music helps too! In the next blog I am going to share how I create my beautiful hanging sleeves for the back. Cindy, thanks so much for this, we need to learn this part, too! Beautiful quilt. Love all your tips, especially on blocking. I'm just starting to learn the tricks and benefits to blocking a quilt. I've never blocked a quilt before, but I'm definitely going to try it now. Thanks for the great instructions. Love how you do this process-thanks for sharing. I will be trying this out soon!! La Petite Jaune Piquer is just so beautiful!